My Dad used to tell us that pepperoni was for babies. He thought the only reason we ate it was because it’s all we knew growing up. I beg to differ. I am a full-on grown adult and I still LOVE pepperoni pizza. Sorry Dad….this may be one instance that you are wrong. Oh and don’t get me started on crispy pepperoni. That stuff is addicting! 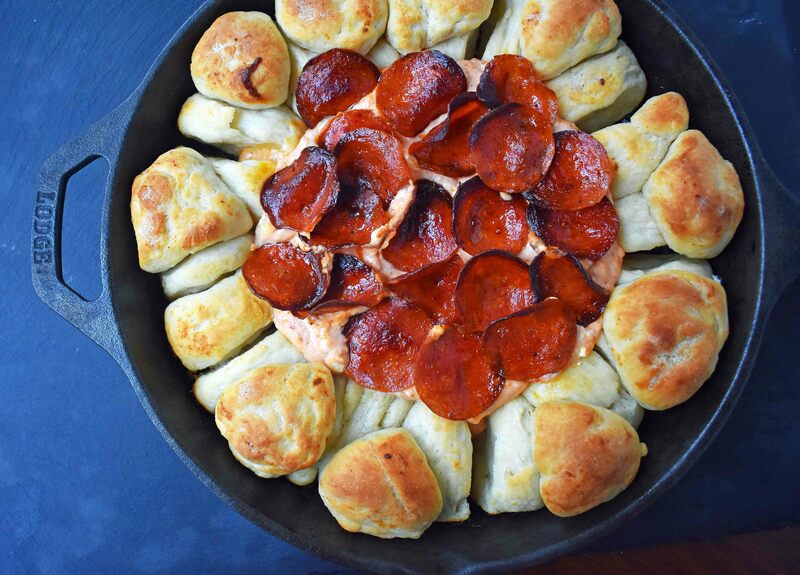 This Pepperoni Pizza Dip with Pizza Crust Dippers is the ultimate Super Bowl Food. 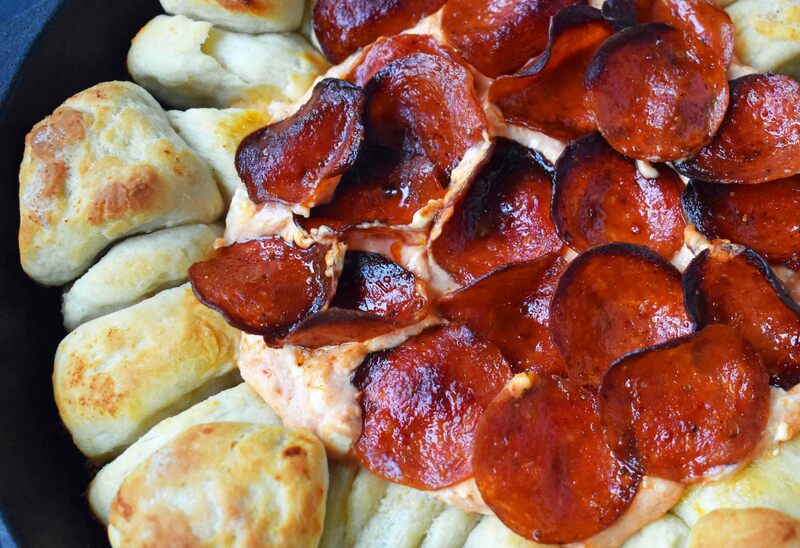 We are turning pepperoni pizza into a rich, cheesy dip. The pepperoni pizza dip is made with cream cheese, pizza sauce, oregano, red chili flakes, mozzarella cheese, and parmesan cheese. The pepperoni is crisped up in the oven ahead of time to bring out its flavor. Pizza dough is rolled into small balls, dipped into garlic butter and all baked together in a cast iron skillet. The garlic butter pizza crust dippers are used to dip into the pepperoni pizza dip. Yes!! This is a recipe I have been tweaking and play with for months, after seeing something similar on America’s Test Kitchen. I tried the recipe, but wanted the dip to have more flavor! The addition of oregano, red chili flakes, and parmesan cheese made a huge difference. The pizza dough is dipped into garlic butter rather than garlic oil….we want layers of flavor with this dish! The pizza crust dippers are partially baked for 10-12 minutes before adding the pepperoni pizza dip to the cast iron skillet. The pizza dip is then heated through and the rolls become a golden brown color. If you don’t have a cast iron skillet yet (get one!) then you can use any oven-proof skillet. You can crisp up your pepperoni ahead of time in the skillet. My favorite pepperoni is Boar’s Head sliced packaged pepperoni. 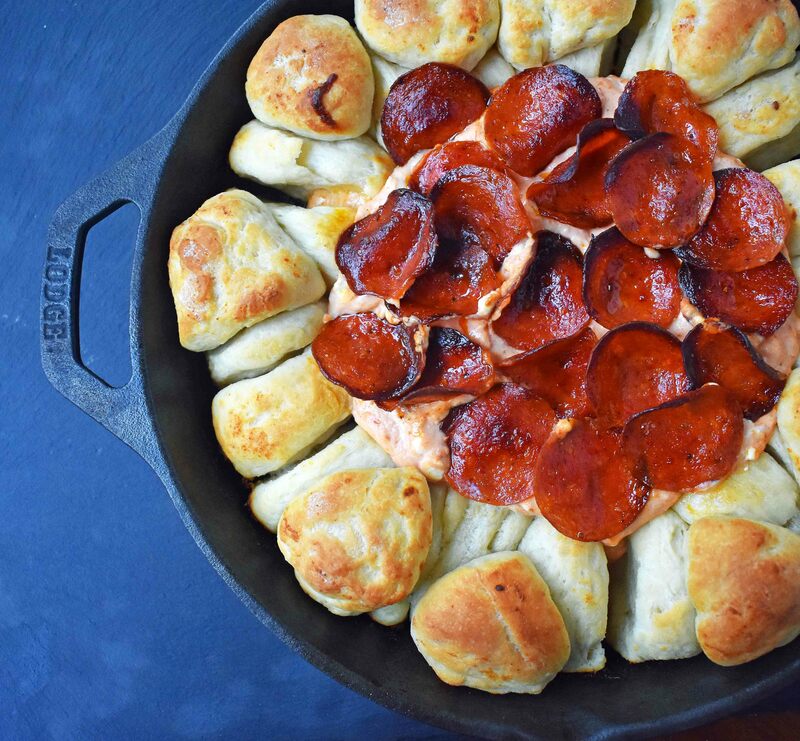 Creamy pizza dip topped with crispy pepperonis and garlic butter pizza crust dippers. Heat oven to 400 degrees. Cook pepperoni in 10-inch cast iron skillet over medium heat until crisp, 4-6 minutes. Transfer to paper towel-lined plate. In microwave-safe bowl, melt butter in microwave. Stir in garlic powder. Place dough on lightly floured counter. Pat into square and cut into approximately 20-24 pieces. Roll each piece into a ball. Coat each ball with garlic butter. Place each dough ball around edges of cast iron skillet, leaving the center of skillet open. Stagger the dough balls on top of each other. Cover with plastic wrap and let rise for 20 minutes. In mixing bowl, cream together cream cheese and pizza sauce. Stir in oregano and red chili flakes. Stir in mozzarella cheese, parmesan cheese, and 3/4 of crisp pepperoni. Set aside remaining pepperoni. Remove dough from oven and drizzle any garlic butter that has pooled into the center of the skillet onto the pizza crust. Spoon cheese mixture into center of skillet. Return to oven and bake until dip is heated through and the pizza crusts are golden brown -- about 12-15 minutes. Remove from oven and add remaining pepperoni. Cook for 1 minute longer. Top with fresh basil ribbons and serve immediately. 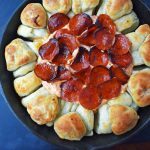 This Pepperoni Pizza Dip with Pizza Crust Dippers is fabulous for parties or when you need a delish appetizer.